I recently watched the pop up video for Rick Astley's famous jingle jangle, "Never Gonna Give You Up." One of the dancers (the bar tender) in the video arrived On Set extremely hung over, and performed dances and stunts like back flips. He even passed out on the pool table for 2 hours. What he did took courage! My hero with a high ball glass. 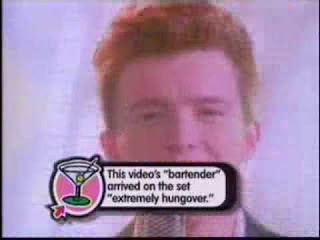 I couldn't load the pop up video, but here is the classic for what it's worth. QATFYG: Have you ever arrived to work hung over? And have you have you ever passed out on any type of table?